There’s no need to leave your pooch behind when you venture down to Cornwall’s beautiful coast and countryside. We’ve handpicked a selection of hideaways that both you and your pup can enjoy when your visiting Cornwall. Whether you’re looking to stay by the sea or in the countryside, Cornish Horizons have a huge 391 dog-friendly cottages to choose from, 31 of which will accept three or more dogs, so you’ll be spoilt for choice when searching for that perfect retreat for the whole family. You’ll be able to pick from key locations such as Padstow, St Ives, Fowey, Looe and Porthleven. Or, if you’re a first timer to the area, you can rely on the team at Cornish Horizons and their wealth of experience and local expertise in the holiday lettings business to seek out that perfect stay. On arrival, pop your bags down and settle into your Cornish retreat, then take the opportunity to explore the South West Coast Path. With miles and miles of walks to explore, you can keep yourself and your best friend busy by taking in the spectacular scenery that Cornwall has to offer. Once you’ve finished your walk, head back to your cosy cottage to relax in luxury and plan your next Cornish exploration. At the heart of magical west Cornwall and set within four acres of verdant green fields is the picture perfect Stonesthrow Cottage from Cornish Gems. This stunning three-bedroom, four-bathroom base is perfect for exploring the area and learning more about Cornwall’s rich history. From your doorstep you can experience the natural beauty of Penwith including Sennen, Land’s End, Portherra Beach, Porthcurno and many more iconic haunts. Walks are always interesting and varied in this area, featuring sea views as well as beautiful moorland where you’ll pass Neolithic stone circles, buzzard nests and heron ponds. After all that pooch-led exploring, you can enter the cottage via the stone-floored utility room through the boot entrance, where paws can be wiped. You’ll find a conveniently placed hosepipe outside too, just in case those walks were extra sandy or muddy. The cottage, very thoughtfully ‘kitted out’ with your dog in mind, features a ‘doggie room’. With cupboards on three sides and an en-suite too, you can easily give your doggy a refreshing bath if needed. Then, what better way to end a day of exploring than taking advantage of the hot tub in the garden, especially nice to warm up in during the autumn and winter months. Or, you can skip straight to snuggling up with a blanket and a good book in front of the warming wood-burner. 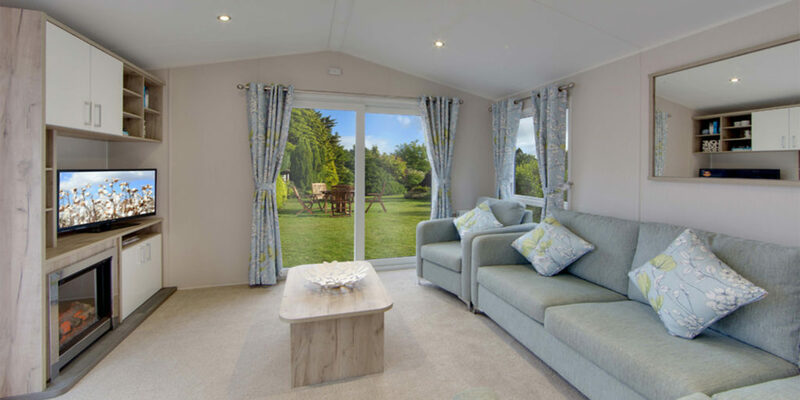 With a welcoming atmosphere, set in twelve acres of beautiful Cornish countryside and just two miles from the sandy beaches of Praa Sands, Boscrege Caravan and Camping Park is a brilliant place to enjoy your Cornish holiday in luxury. Each contemporary, pet-friendly, static holiday home comes with a private garden enjoying stunning views, perfect for families and couples to relax in on a crisp autumnal evening, after adventuring around the Cornish coast. If your pup is yet to tire after a long day, take advantage of the two designated dog walking fields, which include bins, at the rear of the holiday park. A brilliant spot for your pooch to have one last run around before you all settle in for the evening. As you relax, you’re able to use the park’s free wi-fi to share your idyllic Cornish holiday snaps, sure to make all your friends back home jealous. 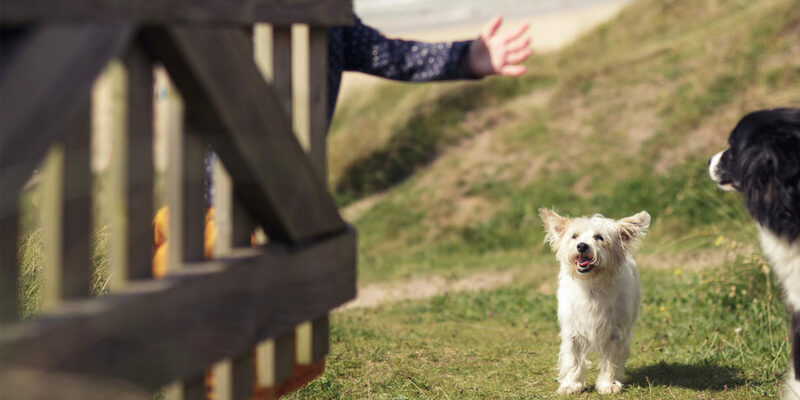 A holiday without your dog often feels like something is missing, that’s why Forever Cornwall has over twenty unique retreats that are pup friendly, with plenty of open places to explore. Explore stunning locations like Gwithian and Godrevy, which have eight dog-friendly chalets and beach houses right in the heart of miles of beautiful golden sands. As you head north, Port Gaverne, a perfect little cove right next door to Port Isaac, showcases ten dog-friendly cottages, adjacent to the award-winning pub, and right next to miles of fabulous coastal footpath. What is a Cornish holiday without letting your four-legged friend run wild and play on the beach during your stay? Luckily, from October to mid April, 133 of Cornwall’s 139 beaches are dog-friendly! What’s more, you’ll be pleased to know that, as dog owners themselves, Forever Cornwall understands what dog owners need from a holiday cottage – hardwood or slate flooring and cosy cast iron wood burners, so after a fresh countryside walk or some cliffside storm watching you and your pup can just relax without the worry of mucky paws making marks that can’t be wiped up in a second. 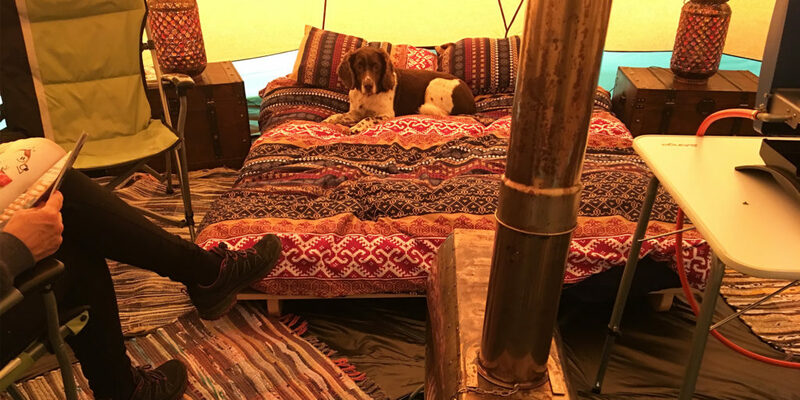 If you’re thinking of spending your time in the Duchy in a stay that’s a little closer to nature, then the dog-friendly camping or glamping at Nomadic Camping could be the perfect solution. With sites throughout west Cornwall, select where you would most like to set up camp and Nomadic Camping will set up a Tentipi for you, with either a basic camping package or a full glamping package. For even more comfort and luxury, you could stay in a touring caravan, with everything you need included and set up on your arrival. If you are hoping to have a place close to the coast so you can make the most of dog walks on the beach, Higher Trevaskis or Gwithian farm are great options, these are both just moments from Gwithian beach with all year access to miles of soft sand for digging and rock pools, perfect for swimming or for a quick refreshment during your walk. If you prefer walks through lush Cornish woodland, Gwel an Nans Farm site is perfect, situated next to Cardinham woods and the stunning Lanhydrock estate. 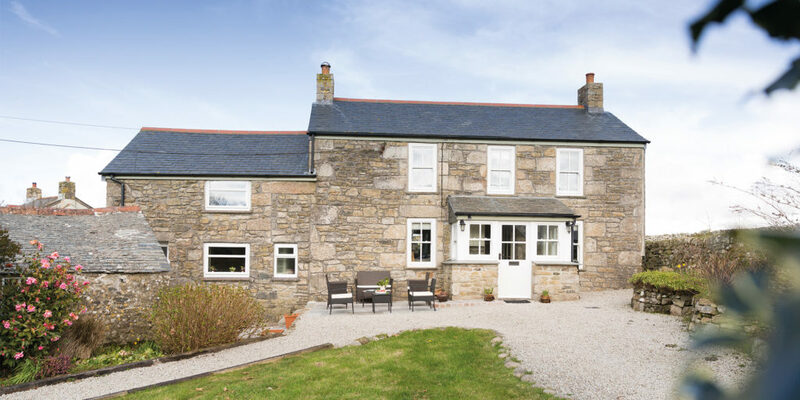 If you’re thinking “but wait, I enjoy walks by both coast and country”, well, don’t fret; for those that would like a mix of both, Trerise Farm, situated in the heart of the rugged Lizard peninsula, or Trevellas Manor Farm on the north coast are both ideal. So, we think you’ll agree, there are plenty of options when it comes to staying in Cornwall without leaving your best friend behind, just remember to bring your waterproofs and walking boots!